Whether it’s mountain bikes on our high desert trails, hybrid commuters on our city streets, or balloon-tire beach cruisers on our public coastline… Oregonians love riding their bicycles! The Beaver State is a well-known “hub” of self-powered transportation in policy and in practice, so it is interesting to look back to the past and examine the history of this phenomenon. Historic Oregon Newspapers provides an excellent avenue for this kind of research, as the digitized papers date mostly from the late-1800’s and early 1900’s–the first Golden Era of cycling in America. The earliest form of two-wheeled transportation dates back to a German patent of 1818. Known as the “laufmaschine,” “draisine” or “dandy horse,” this device consisted of a pair of in-line wheels with a saddle and handlebars. However, unlike a true bicycle, it lacked pedals. Rather, the “dandy horse” was propelled by the rider’s feet making contact with the ground in a regular walking or running motion. The new invention created a brief sensation, but failed really to catch on with the general public. One obstacle to its long-term popularity was the need for each unit to be made to measure for a specific rider, in order to conform to the individual’s exact height and stride. Also, being composed entirely of wood, the draisine was not particularly comfortable or durable, and its practical use was all but limited to smooth garden pathways. Eugene Meyer of France invented the metal-spoke tension wheel in 1869; ball bearings, solid rubber tires and hollow-section steel frames were innovations that followed in the 1870’s. 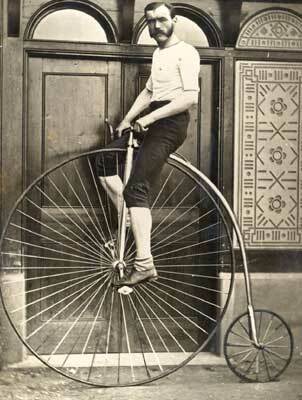 This was the decade when the high-wheel design nicknamed the “penny-farthing” was most popular. Although they may appear somewhat awkward to us today, their over-sized front wheels made these bikes very fast: witness an article from the May 5, 1876 Salem Willamette Farmer, “Bicycle Vs. Horse.” In the English contest that was the subject of this report, Stanton, the cyclist, defeats “a fast horse named Happy Jack” on a ten-mile course, pedaling a 58-inch, 40-pound “machine” at an average speed of 18 miles per hour. The era of the penny-farthing was the time when the term “bicycle” first began to be commonly used. In those days, cycling was still regarded as the exclusive province of sporting, aristocratic young men. Even with the continuing advancements in manufacturing technology, the high-wheeled bikes remained expensive, dangerous, and “most unladylike” according to Victorian sensibilities. All of this would change with the development of the so-called “rover” or “safety bicycle” in the 1880’s. The revolutionary design innovations achieved in this decade included the rear-wheel chain drive, pneumatic tires, and the diamond-pattern frame. Collectively, these inventions produced a bike design that was safer and more comfortable to ride, easier to corner and steer, and much less expensive to manufacture along standardized lines. It was, in summary, the emergence of the familiar bicycle design that is still with us today! The popularity of bicycling played a particularly vital role in the movement for “rational dress” for women. As it was next to impossible to pedal safely in restrictive corsets and voluminous, ankle-length skirts, female riders began to substitute a “shocking” new garment called bloomers (see illustration from the Salem Capital Journal above.) 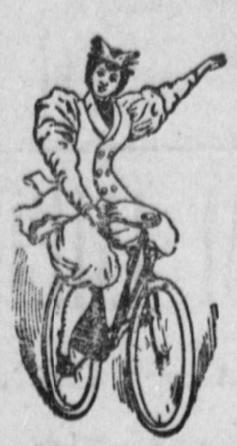 Other sartorial innovations soon lead to a whole new style of active wear for women: see “Smart Togs For Cycling” on the Fashion page of the May 20, 1900 Sunday Oregonian. 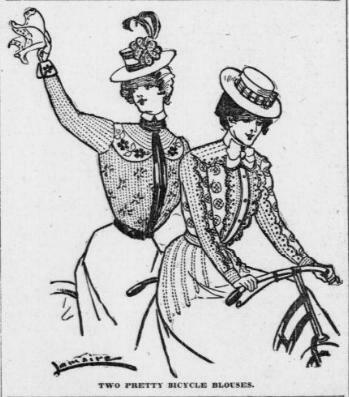 "Pretty Bicycle Blouses" from Portland Sunday Oregonian, May 20, 1900, p.26. "Divided skirts, brilliant shirt waists, light hats, and easy shoes" are recommended! Even the retail landscape was changing. 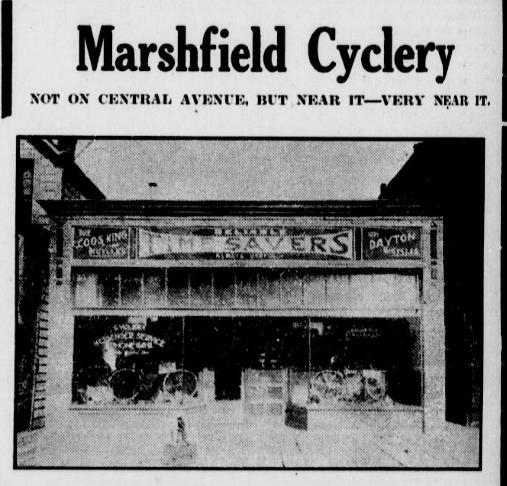 In prior times, cycles were “novelty” items that were mostly sold by carriage shops, general stores, and gun shops. 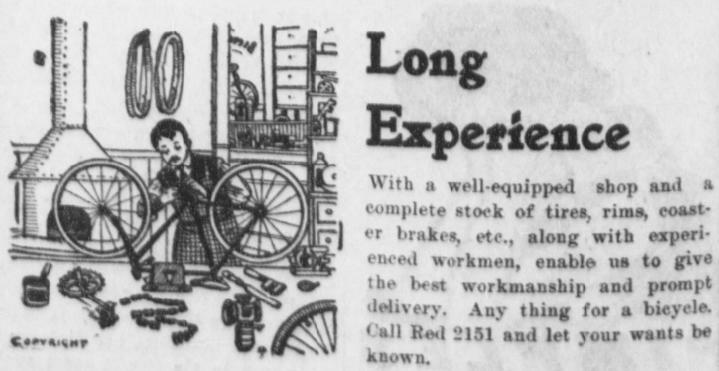 But beginning in the early decades of the 20th century, specialty establishments exclusively dedicated to selling and servicing bicycles began to appear in many Oregon towns. As cycles became evermore popular fixtures on the American scene, they came to feature in “extreme” forms of public entertainment. Exhibitions of stunt riding began to get coverage in the early Sports Pages, and, thanks to our newspaper digitization, contemporary readers still can thrill to the wheel-borne exploits of the Astonishing Aussie and the Gravity-Defying Diavolo in the pages of the Portland Oregonian. News of long-distance bike touring also intrigued the public: on October 16, 1913 the Ontario Argus reported the arrival of circumnavigating cyclist C. J. A. Pahl in Eastern Oregon. Another novel account is seen in a 1900 item from the Portland New Age, covering an English plan to develop a military corps of cyclists. 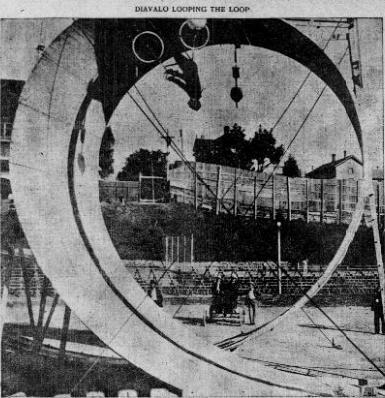 "Looping The Loop" from the Portland Morning Oregonian, August 11, 1903. The paper reported that 10,000 spectators watched the feat performed at Multnomah Field. Even while many unusual and exciting applications of the bicycle were being discovered, it made its most profound impact in the more humble field of public transportation. Once the eccentric status symbol of rich aristocrats, the bike was now viewed as a highly practical investment for the working man. Bike ownership was regarded as a key to improved health, shorter commuting times, and more wide-ranging leisure. All over America, cyclists’ clubs and societies were formed to promote bicycle use and ownership. The largest of these clubs, the League of American Wheelmen, was one of the first organizations to actively lobby for a system of paved roads throughout the United States. Sadly, however, the “Golden Age” cycling craze was a phenomenon of the “Gay 90’s” that had mostly run its course by the advent of the “Roaring 20’s.” In the years following World War I, automobiles increasingly assumed the more prominent place on America’s roadways and in Americans’ imaginations. It was a classic incidence of our eternal fascination with that which is newer, bigger, and faster. By the 1940’s, bikes had come to be regarded by most Americans as mere toys, and the great majority of bicycles in the U.S. were now manufactured in children’s sizes. Cycling as a pastime of adults would not return to prominence in America until the early 1970’s. It was, fittingly, a revival that occurred when people began to recognize some of the more negative impacts of our automobile-dependence upon the environment and our lifeways. 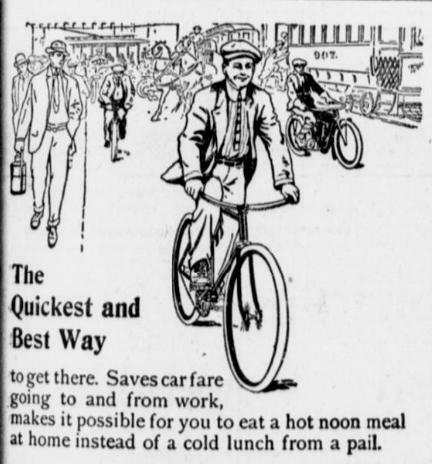 Benefits of Biking, from Coos Bay Times, Evening Ed., March 20, 1914, p.5. Note the other forms of transportation pictured: trolley cars, horse-drawn carriage, walking. The automobile is yet conspicuous by its absence. HI Jason. You might be interested in my research on a more narrow question, the bicycle path legislation of 1899. Many of your observations I hope you will be happy to learn can be dated earlier! Sidewalk ordinances started many years before 1903, bike shops were a late 19th century rather than early 20th century phenomenon, the military corps tested in 1896/97, and the narrative of bikes as “toy” well established before 1940. There is indeed a wonderful history of bicycling in Oregon, and obviating the need to trawl microfilm tediously is equally wonderful. Thanks for the project! Thanks for sharing your research, Eric! Sounds like you have a strong base of knowledge on this topic. The Historic Newspapers are an excellent starting point for all kinds of historic research, but, as you draw attention to here, they can’t always fix the precise dates of origin of broad, social phenomena. In fact, coverage in the press–then as now–more often than not indicates “mainstreaming” of trends, rather than their initial formulation. Excellent article. I search ODNP often, and a recent find relates to above. Major E. A. Weed and a Mr. Murphy rode from Portland to Mt. Hood and back, this 116 years ago (see Oregonian 10-28-1895). 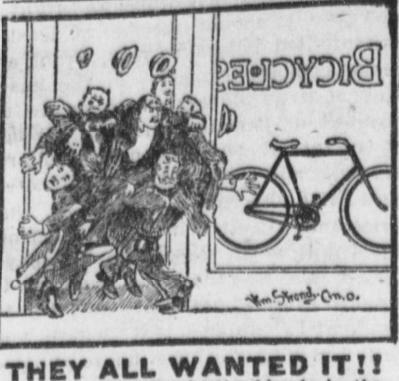 1 Pings/Trackbacks for "Oregon On Two Wheels: The History of Cycling in Our Historic Newspapers"